I am nervous this morning as I write this post; my stomach’s all fluttery, and not really in a good way. After last week’s kerfuffle over sexism, HLS, and internet trolls, I am a little hesitant to dip my toe into the waters of internet controversy yet again, especially on a topic related to feminism, but I’ve been thinking hard about something and I want to use my blog to help me process it, because, you know, it’s my blog. So, buckle up, trolls and non-trolls! Here we go, again. I watched this video at eight o’clock in the morning the other day and cried. I’m not ashamed to admit it! This ad got to me in a way that advertising rarely does; the last commercial I cried at was a Folger’s commercial and that was years ago. Okay, maybe that one Google ad made me mist up a little bit but seriously, if you don’t mist up at that Google ad, you might be a robot. Anyway! I thought that the Dove ad was moving and beautifully shot and, well, important. If you haven’t watched it, in a nutshell: Dove brought several women to this artsy abandoned warehouse, sat them each down behind a curtain and asked each one to describe herself to a forensic artist, who then produced sketches based on the women’s self-descriptions. The organizers of the “experiment” (and I get that it’s not a scientific experiment, but I’m going to refer to it that way, anyway — everyone just relax) had asked each woman ahead of time to become friendly with a stranger. The strangers were then brought in front of the sketch artist to describe the women, et voila!, at the end, the sketch artist had two sketches for each woman: one that she had described of herself, and one that a stranger had described of her. Perhaps unsurprisingly, the sketches as described by the women themselves were harsh and unflattering, whereas the sketches as described by strangers were much “gentler” and more flattering. So, I watched this thing, I shed some tears, and here was my takeaway from it: we women need to go easier on ourselves. The way we view ourselves might not be — in fact, probably is not — accurate. We should give ourselves the same consideration as we would a stranger. We should look at ourselves gently and appreciate our own beauty, in whatever shape or form it may take. That’s all. And for me, that message is powerful, because I’ve struggled with my own self-image for as long as I can remember. I was the type of little kid who always thought I was fat, or ugly, and those insecurities have waxed and waned over the years, but they’re always there, even now. Seeing this ad was a good reminder of how distorted my own self-image can be, and how unproductive it is to view my own physical being negatively. So, for me, this ad was positive and uplifting and moving. In her post, Jazz harps on the fact that some of the strangers in the ad, while describing the women they had met, emphasized features such as a “thin face” or “blue eyes,” and argues that this “kinda seems to be enforcing our very narrow cultural perception of ‘beauty’: young, light-skinned, thin.” I suppose the strangers’ comments can perhaps be put down to the fact that our society values thinness and whiteness. Or it could be that the particular woman being described was thin and white. Or it could be that those were the features that stuck out to this particular stranger, for any number of reasons. So I guess it’s fair for Jazz to criticize the ad for focusing on those features rather than others, but the fact that the end results — the sketches as described by strangers — were not a parade of thin, white, blonde women is telling. Dove wasn’t trying to convince all of these women that they are, in fact, beautiful Barbie dolls with blonde hair and perfect smiles; Dove was simply presenting an alternate vision of their looks, as perceived by strangers, presumably with no particular agenda to promote. Okay, so let’s hold the phone right there. First of all, I agree that “what you look like should not affect the choices that you make.” However, the way you feel about your looks very well could impact the choices you make. I know this for a fact, from my own life: if you feel like you’re gross, or ugly, or fat, or whatever, it absolutely does impact the way you interact with the world. It affects everything. Really. The message of the Dove ad, as I perceived it, was not: “You must be good looking in order to make positive choices,” but rather, “Change the way you see yourself and it will impact your choices positively.” There’s a huge difference between those two messages. As a person with a whole bunch of interests and skills and thoughts and feelings that add up to make me me, I certainly don’t believe that my external beauty is the most important thing about me, and I wouldn’t support an ad that sent that message. But that’s not what the Dove ad was trying to say. And I think it’s insulting to women like me who were moved by this ad to suggest that we’re being brainwashed by some sort of patriarchal, capitalist, ethnocentric (etc., etc., insert your favorite negative “ism” here) cultural narrative about beauty because it struck a chord with us. I’m a savvy enough consumer of media to be able to tell when a company’s selling me a bill of goods. While I appreciate Jazz’s reminder that I am “so, so much more than beautiful,” I already know that, logically. But to pretend that women’s self-perception of our looks is not important to the way we move through the world is unrealistic at best, and disingenuous and even cynical at worst. Finally, Jazz points out that because Dove is owned by Unilever, a company that also owns brands such as the odious AXE body spray, which is infamous for their sexist approach to advertising, we should discount Dove’s marketing campaigns as so much patriarchal smoke and mirrors. While I think it is important to be a critical media consumer and to consider carefully a company’s agenda in promoting a certain product, I don’t think it’s fair to dismiss the genuine emotional reactions that Dove’s ads inspire in women because Dove’s parent company has promoted anti-woman messages to promote other products. In fact, I think it’s entirely possible to appreciate the Dove ad’s message without buying Dove products or otherwise supporting Unilever, which, by the way, also owns such socially conscious brands as Ben & Jerry’s, so if you’re gonna boycott Unilever, say buh-bye to Chubby Hubby. While I think it’s important not to support brands that promote a message you actively disagree with or are offended by, I also think that Dove should get some recognition as one of the few women’s beauty brands that has made an effort to disseminate a broader, more diverse conception of beauty. Maybe Jazz and I are just coming at this from two fundamentally different perspectives. Perhaps she has a much stronger self-image than I do, and so the ad didn’t resonate with her in the same way it did with me. That’s fine. We’re allowed to have different reactions to media without accusing one another of being duped or brainwashed or suckers. What do you all think? Did Dove’s ad hit the mark or miss it entirely? 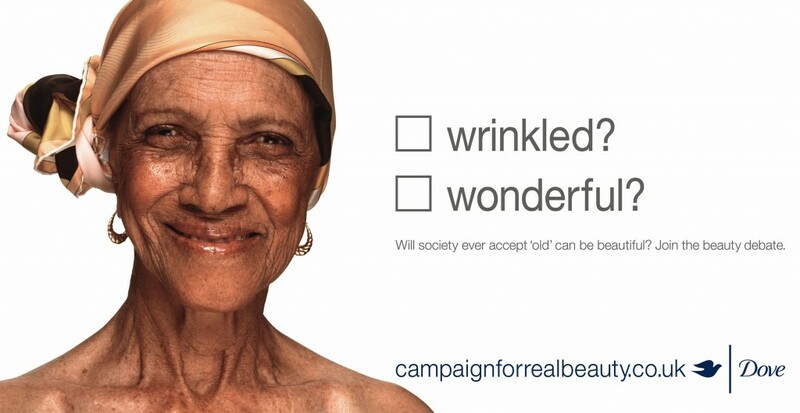 This entry was posted in Life and tagged advertising, beauty, Dove, feminism, life on April 19, 2013 by Stephanie.